There’s something romantic in the idea of walking out into your yard and picking an apple off of your own tree and taking a big juice bite out of it! This notion becomes even more intense once you have your own kids – who of course, are crazy picky eaters. In an attempt to selfishly fulfill my own dream and encourage my children to have a healthier relationship with food, I’ve been trying to plant more (decorative) edibles in my landscape. 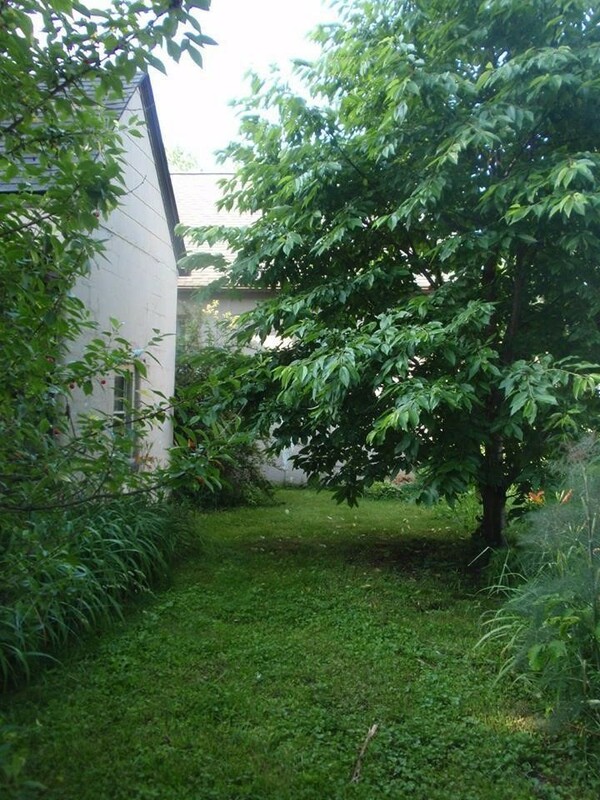 Living in town, I don’t have the space available for a straight up orchard, but rather, I’ve been mixing in fruiting trees and shrubs within my normal (ornamental) garden beds. And having a bit of chaotic life, I’m seeking out easy to care for – will come back year after year without me having to replant them annually- delicious tasting food. Not high maintenance. Low key rather. I’m starting off with a small cluster of Pawpaw, a slow growing local, which will hopefully start baring fruit ten years or so from now. Not exactly a quick return on investment, but they are beautiful trees- fruiting or not. I also planted raspberries, which I’ve never fertilized or needed to spray – only getting the occasional trimming of the tops from deer. They have provided more bountiful harvests as the bramble has established itself. Twice a year (once in the spring and again in late fall) I chop out shoots with a shovel that have escaped their intended area. 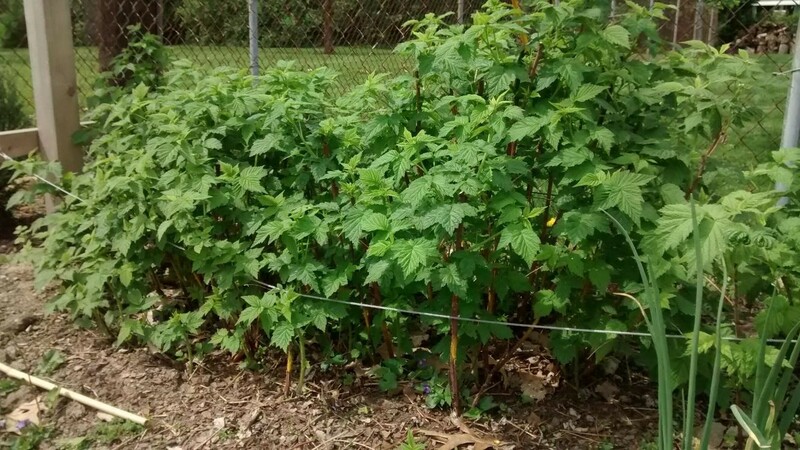 Monrovia has come out with a new variety of red raspberry, Raspberry Shortcake, which is thorn-less and is compact growing 3’ around. Perfect for containers or small gardens. After consulting with expert (and fellow Oakland Nursery compatriot) Cat Baumgartner about my efforts, she has opened my eyes to a wider array of easy-to-care-for perennial edibles for the garden than initially suspected. Despite my daydream, I’ve been hesitant to actually plant an apple tree. Old varieties need quite a bit of space and it’s always been recommended that you have two of varying varieties for good pollination. Which in my mind equals eating up more of my limited space. Then there is the whole spraying obligation that complicates the issue. But Cat was able to clear some things up and now I feel enabled to plant said apple tree. Yes, just one. Why? Because Cat knowledge bombed me – which I’m happy to pass along to you as well. In town, there are so many crabapples, that you really don’t need the recommended pollinator tree. 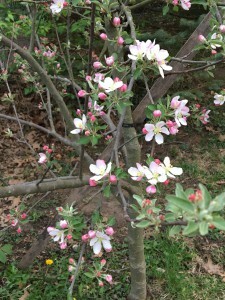 Crabapples will pollinate your apple tree! There are also quite a few dwarf and semi-dwarf varieties and with the realization that I only need to plant one, the space issue is no longer a concern. She also recommended using Orchard spray if scab gets out of hand. Did you know that apples are still edible if they have scab? I didn’t! Yes, they look slightly less appetizing, but if you were going to be making sauce, pie, cider or what have you anyway, then no worries about a little scab. And if does become too much for you, the Orchard spray label with detailed directions are really easy to follow. 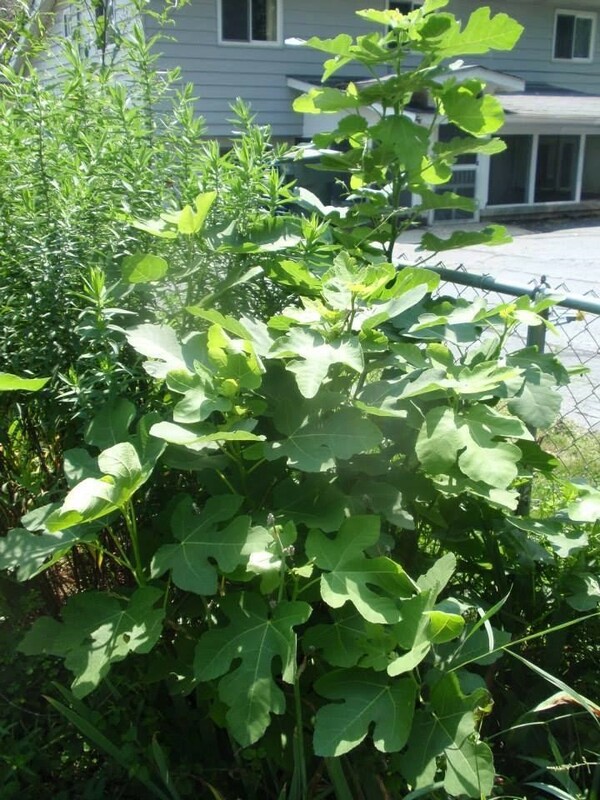 It also helps to clean up all the infected leaves once they have fallen and don’t add them to your compost pile. 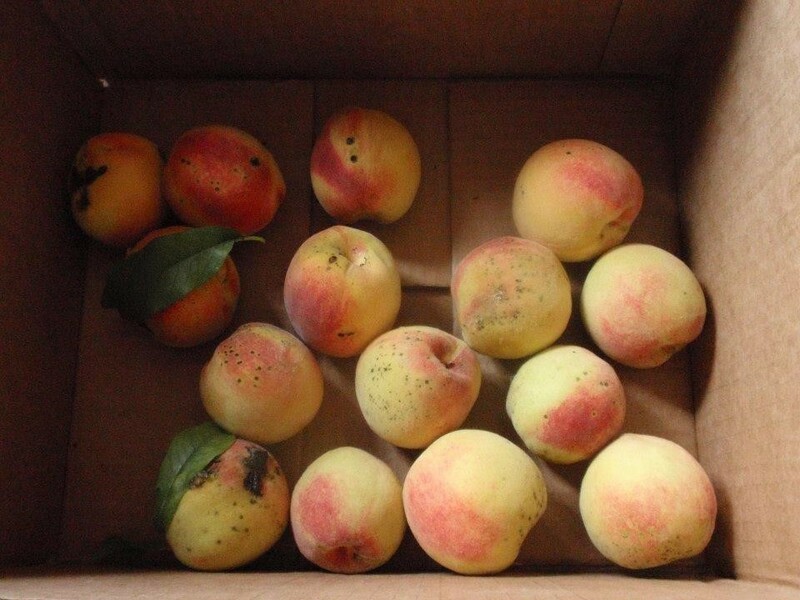 (Cat’s beautiful peaches despite having a bit of scab – the small black spots) And no, Peach trees didn’t make the short list, because of their short life span. Figs! There are more things to do with figs than make Figgy pudding- my neighbor likes to eat them fresh off the tree! Brown Turkey and Celeste are two varieties of fig that are “hardy” in central Ohio. Quotations are necessary here, because they do need winter protection if you want any fruit for the following season. 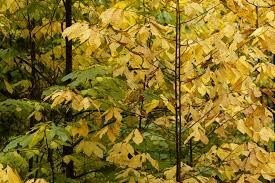 It’s easiest to protect them by placing a large tomato cage around the tree and fill with leaves in the fall. Figs also have a gorgeous giant leaf giving them a tropical look- which can be fun. Growing citrus wasn’t even on my radar, as I thought that was more of Florida and California thing. It turns out there is one lovely exception, the Persimmon. This sweet tasting citrus is harvested after the tree drops all of its leaves, giving it seasonal interest in late fall/early winter, when there isn’t typically a lot of interest going on in the landscape. Lastly, the Cherry. 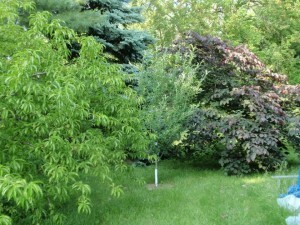 The uniformly rounded tree form is a small size – 25’ or under depending on the variety. They also have a showy spring bloom. 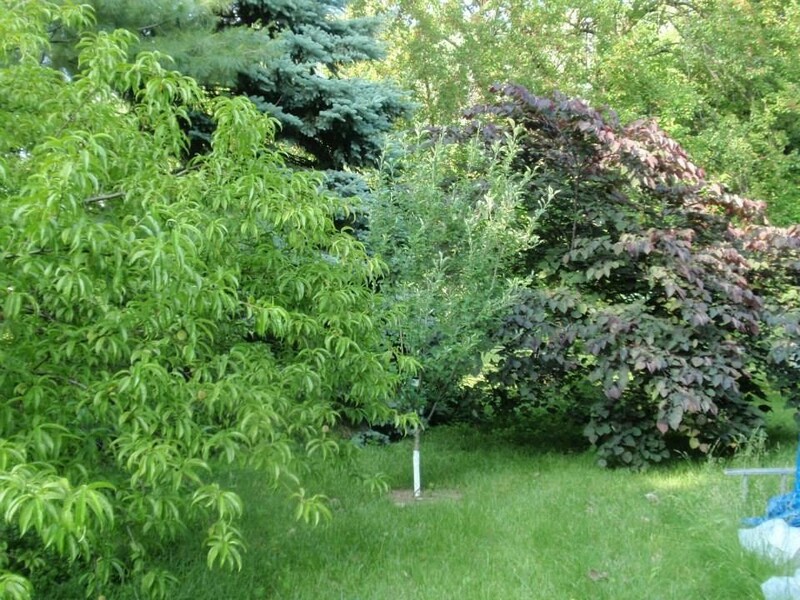 There is a Dwarf Korean Cherry, which is a shrub form and self-pollinating! This is what I have planted (next to my raspberries) and this will be the first year I’m going to cherries from it! 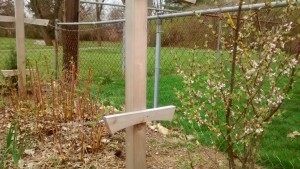 I planted it two years ago, but last season a late freeze killed off the flowers. Freezes are an uncontrollable risk to any in-flower fruiting tree (or shrub) you may have, but it will make you cherish your harvest that much more in the good seasons! 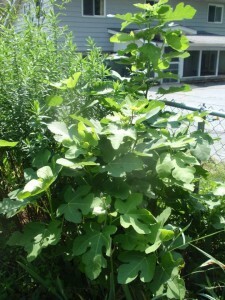 Please consider planting some of these easy care edibles to your garden, they’ll enrich your landscape and your food fare! This entry was posted in cooking, Design, Gardening, Landscape, permaculture and tagged Fruit, garden, gardening, landscape, Plants, Shrubs, Trees. Bookmark the permalink.